A note from Aunt Cella includes passages from her diary that are a simple delight to read! She and Uncle Mike routinely have "porch teas" on their sunny Arizona porch where they reread diaries of the past forty-plus years. I think you would enjoy reading some of her diary passages too. At the end of this one she shares a recipe for her favorite Buttermilk Pie. Grab yourself a cuppa tea and enjoy the read. The Diary. It's August 4, l970 (Aunt Cella is 7 months pregnant) "Lovely rest all by ourselves in this big open lot under a shade tree near York. Beautiful sunny but cool day again. We both exercised on a tiny road, & then drove into York. Found it a delightful place, esp. the old narrow winding streets near the Cathedral. Walked up the famous Shambles Street, a quaint little touristy-charming walking lane with no cars & bosomy overhanging 2nd stories on the houses & shops, so crooked they nearly touched on the tops. Found a sweet little beamed & wall-papered Shambles Restaurant, & having just cottage cheese & peaches for breakfast (& no dinner the night before because I was both resting & punishing my stomach for eating a big breakfast & then apple pie with cream yesterday afternoon), I was hungry! We enjoyed a delightful but cheap lunch (85 cents each) including everything! Soup, rolls, full delicious entree plate (mine was chicken fricassee with Yorkshire pudding & Mike's was steak pie & both were delicious), coffee & dessert! Wow, never such a bargain again I'm afraid. (some lovely camp sites are 50 cents for the night with facilities.) Anyway, "Dessert was gooseberry & apple tart in custard sauce which needed sweetening--but 85 cents!!! After touring the famous cathedral, now being restored & nearly impassable in places, but a beautiful creation, we strolled back through a quaint area till I spotted a winsome old timbered 2 story restaurant, standing amid the stalls of the open market. This place, the Tudor Rose, was delightfully old & beamed & we enjoyed an orange squash on the 2nd floor. Anything to get into these places was our motto! How we sacrificed & suffered! Drove then right on towards the Lakes District & Beatrix Potter country, passing through a town where we stopped for.......let me guess, yes 3 (THREE!) soft ice creams each! And absolutely bereft of our long-used alibi that eating something was just an excuse to get into these places--shameless. We then crossed the Pennines, the rocky backbone of central England via small grey stoned farming towns. This Pennine area is much akin to Scotland, wild, brooding, craggy, green, & lovely. Found a campsite among the many available, high on a hill & commanding a wonderful view. Enjoyed the outlook immensely & also the price of 50 cents!" Aunt Cella comments that "the diary goes on & on. I have notebooks full of those 30 years of traveling. I'm so glad I've got them". She ends her note to me with this: "Now is there room for a recipe? Lemon-Buttermilk Pie 3 eggs, 1 & 3/4 c sugar, 4 big rounded tbsp. flour, 1 stick butter or margarine melted, l c buttermilk, juice & rind of 2 lemons or more ( I use about 4 because we both love strong & tart lemon taste, but then of course you should increase the flour amount). Pour into unbaked pie shell & bake for about 1 hour at 350. Take out even if a bit soupy in the middle. Will set. Yum, yum." 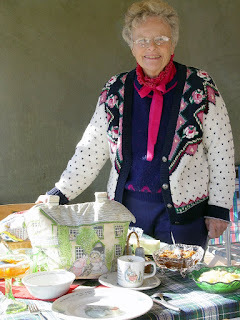 *The photo shows Aunt Cella preparing a "porch tea" in January. Only in Arizona! Oh what glorious memories! Thanks for letting us share with you and your Aunt Cella! Sublime!! I was traveling and eating with Aunt Cella and Uncle Mike!!! A recipe to keep. What memories. Thanks for sharing! I love buttermilk pie. It is such an old fashioned desert. It is a little like sugar cream pie, which is popular in my part of the world. That was so delightful to read. I wish travel was that simple and aforedable today. I'm longing for some pie right now too. You have a real treasure in Aunt Cella and her diary. The recipe sounds yummy. Love, love, love the idea of "porch tea". I don't have much of a porch, but tea in the backyard it a treat, when we have sunny days. Love your posts on Aunt Cella - please thank her. This is so sweet - I loved reading this! I love how she stored up memories for the future. Her recipe sounds a lot like chess pie. I am wanting to give it a try! Has your aunt considered publishing her journals? She's used such wonderful descriptions and the way she shares her excitement at finding a beautiful lunch for a mere 85 cents is so much fun. Nice to read.. I've been in York (I'm norwegian) and walked Shambles street.